It’s Time to Preorder for April, 27th! 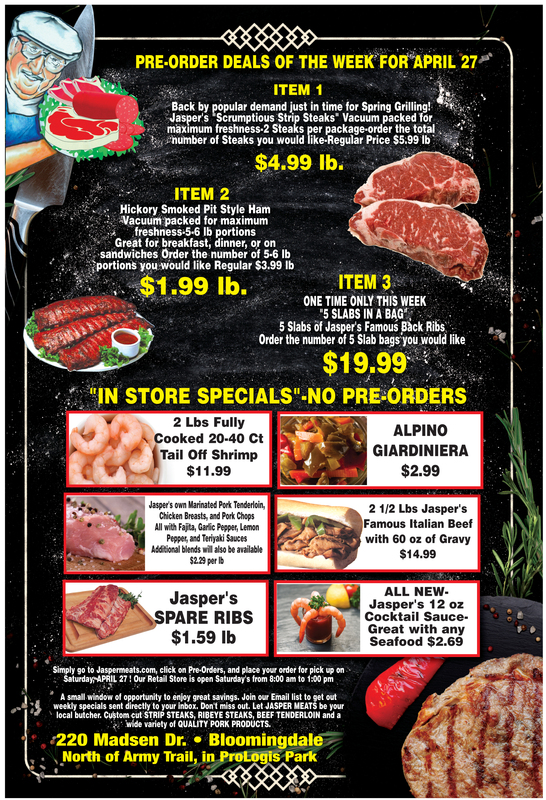 This week we are featuring 3 great items: Our popular Strip Steaks, Hickory Smoked Pit Ham, and Jasper’s Back Rib Bag! Get your Rib Roast, Tenderloin, Beef Roast, Pork Roast, and much more!!! Jasper Meats is a distribution company specializing in smoked sausage products and fresh meats and cheeses. Jasper carries a wide variety of well-recognized Polish smoked meats and has launched their own line of products, made with the finest spices and cuts of meats. These products are available at grocery stores in the Chicago area. Jasper has also started cutting fresh meat at their state-of-the-art USDA processing facility. those are sold at select grocery stores. However, Jasper, doesn’t stop there. We carry a wide range of products, and will provide anything our customers desire to stock their store. From pork, chicken, eggs to a feather duster, we “meat” our clients needs! Please call us at 630.295.9300 and let us show you how!!! OPEN TO THE PUBLIC EVERY SATURDAY! Though we are a wholesale meat market for businesses and restaurants, we are open to the general public 5 hours every Saturday from 8am – 1pm, a small window of opportunity to save more. Put this on your reminder or memo list. When you start out shopping, come here first. You will have plenty of time to visit the other stores. So make a point not to miss out on the savings. This could be the best 5 hours you will spend. Hope to see you all here at Jasper Meats! Come visit our Warehouse for Great Savings! Out of State Delivery – At this time Jasper Meats cannot deliver out of state.